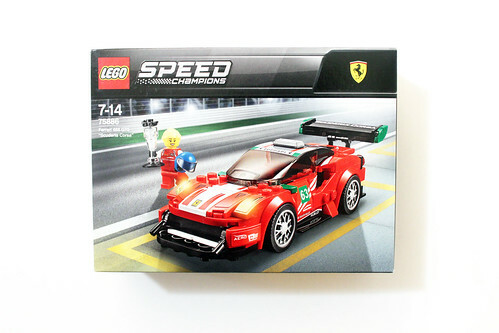 Next up on my reviews of the 2018 LEGO Speed Champions set, the next one that I’ll be taking a look at is the Ferrari 488 GT3 “Scuderia Corsa” (75886). 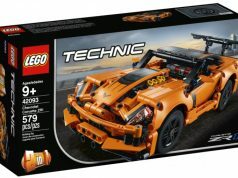 The set contains 179 pieces and will retail for $14.99 starting on March 1. 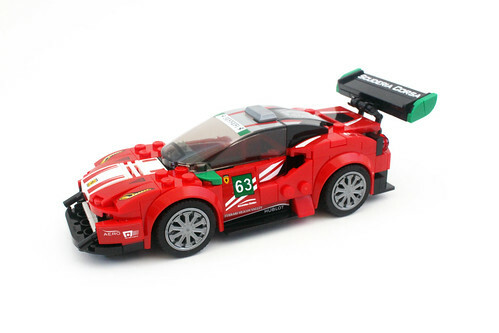 We’ve already had a few Ferraris that have been released for the Speed Champions theme but let’s see if the Scuderia Corsa is a worthy addition to your collection. 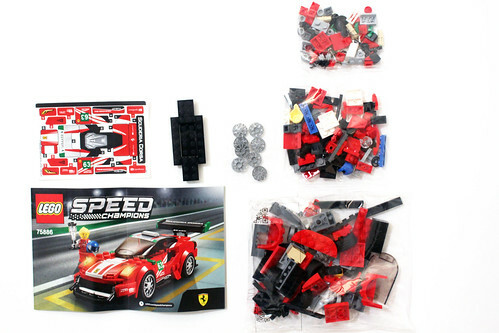 The contents of the box include three unnumbered bags, a bag of rims, the instruction booklet, a sticker sheet, and a loose chassis. 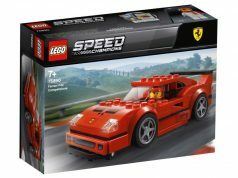 Although the Speed Champions theme has included mostly male drivers, we actually get a female driver in this set. 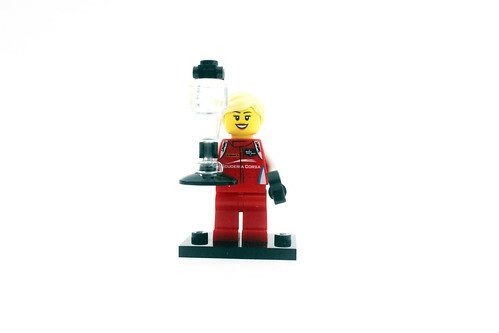 I’m not sure if the minifigure is based on a particular real life driver but it’s nice to see LEGO again spotlighting female drivers. 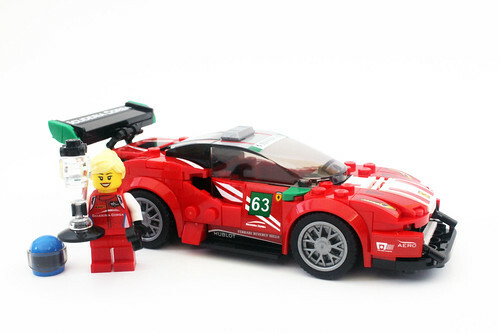 It is possible that it could be Christina Nielsen who was the first female to win a major North American sport car Championship in 2016. 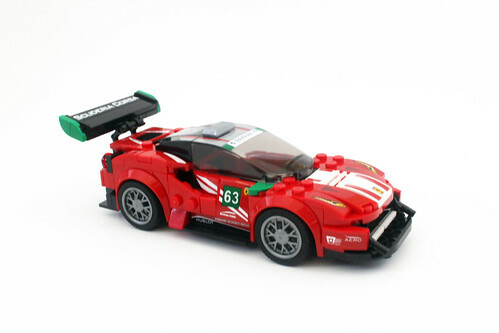 She has on a red racing suit with the Scuderia Corsa logo on the front and back of the torso. Around the shoulders, there’s also some printing of the Sabelt sponsorship. 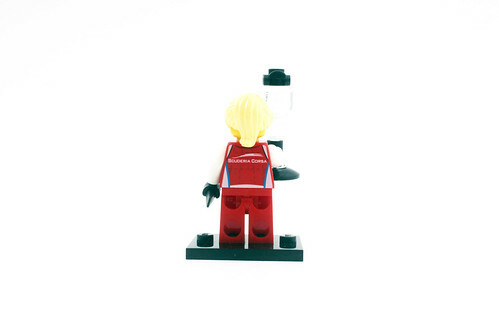 In addition to her blue racing helmet, she also has a blonde ponytail piece for when she’s not wearing it. Her accessories include a black wrench as well as a little champions trophy. 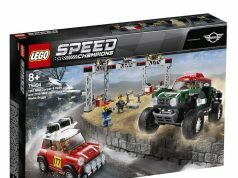 Like with other LEGO Speed Champions sets, the build starts off on the chassis and is constructed outwards. 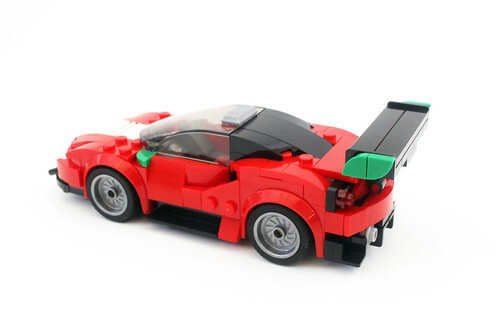 The front of the 488 GT3 looks fairly simple but the most interesting part here is the front splitter. It uses some angled plates for the 1/2 circle plate to be studs down. One nice little detail here is the use of the 1×1 round plates with shaft for the wires to hold the splitter. 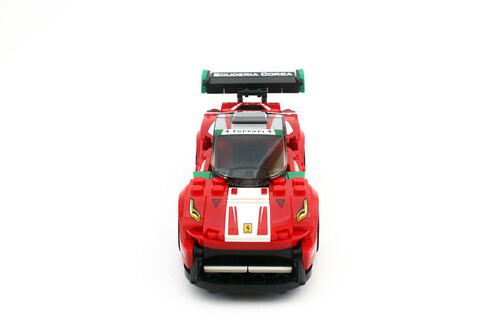 Some sticker detailing in the front include the Ferrari logo on the hood as well as some for the air intake vents. The ones for the lights are yellow presumably because they’re being used for a 24 Hours of Le Mans race. There’s also some stickers on the front bumpers for the Aero Advanced Paint Technology sponsorship. The sides of the 488 GT3 has some very nice looking angles using some curved tiles as well as some that goes into the side air intakes. There are some green quarter-circle tiles that are used for the side-view mirrors. 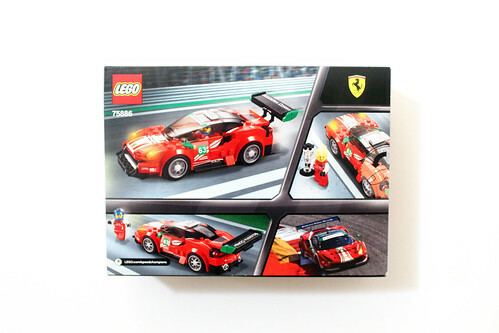 On the doors, there are some stickers for the 63 car with some sponsorships for Ferrari Silicon Valley and Ferrari Beverly Hills as well as for Hublot. The windshield has an angled sticker that goes around the two studs on the top which could be somewhat difficult but I think I got lucky with applying it on the first try. 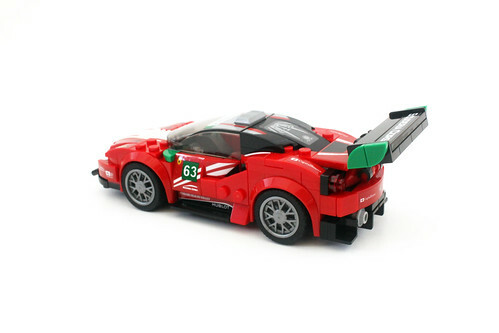 The back of the car also has a lot of interesting details with the main one being the wing that is decorated with the Scuderia Corsa logo. 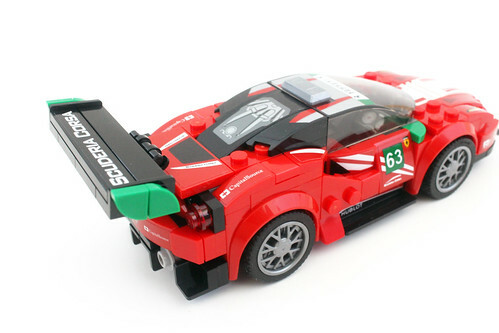 There’s also some green quarter-circle tiles used on the sides of the wing as well. On the back side of the 488 GT3, there’s a sticker for the Ferrari logo that is flanked by the CapitalSource sponsorship logos. 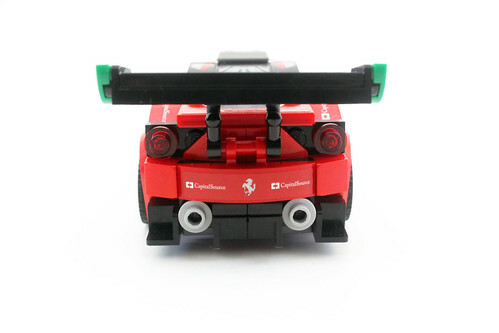 There’s also the rear diffuser which is created using some corner pieces. 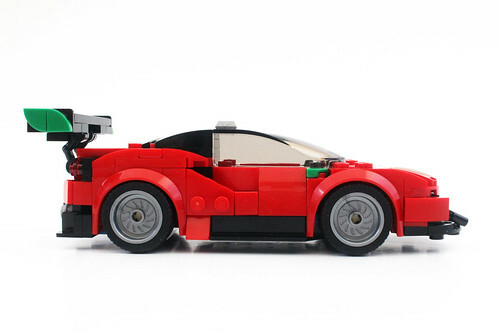 Finally for the wheels, LEGO provides two sets of rims that both look good with either one on. I actually prefer the 14 spoke ones over the 10 spokes. 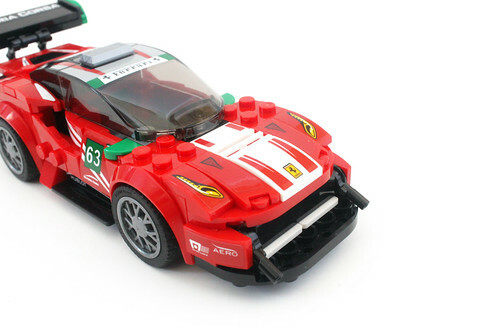 The LEGO Speed Champions Ferrari 488 GT3 “Scuderia Corsa” (75886) is surprisingly a pretty good set. 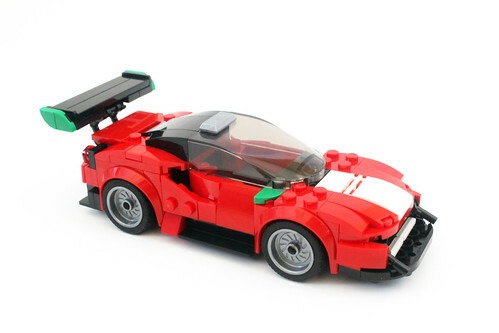 The angles of the car is sleek and the amount of detailing on it is accurate despite the number of stikers on it. I think I spent more time putting on the stickers than building the set itself. 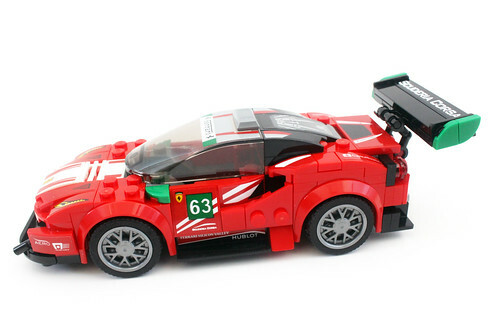 Without the stickers, the 488 GT3 doesn’t look as good as it does with them. 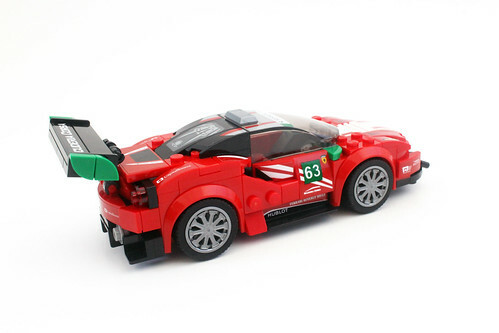 To make it look a little better without the stickers, you may want to change out the green parts. 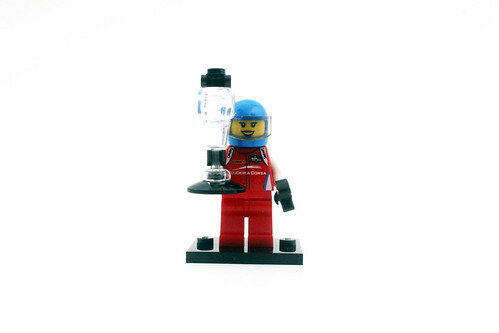 One other nice thing with the set is the female minifigure itself. 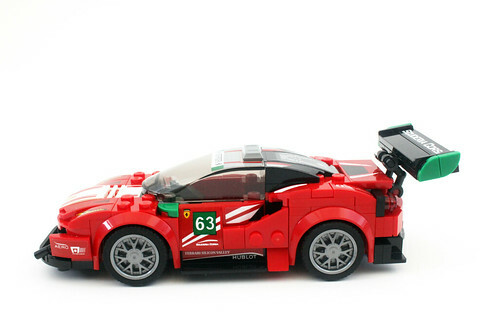 If it is a representation of Christina Nielsen, that would make the set even nicer and more collectible. Even if it isn’t Nielsen as the driver, it’s also cool that there are more female drivers in the theme.